Our visit to Aspen was perfectly timed. It had been snowing for a couple of days and as we pulled in after the 4-hour drive from Denver it was still coming down. When we drew back the curtains in the morning there was about 10 inches of the fresh stuff on the ground. We didn’t even have to discuss our plans for the day - there was only one choice.We grabbed a quick coffee and muffin and headed straight up to Highlands. As was to be expected with so much snow, the hard-working ski patrol were still busy bombing the bowl. We decided not to wait, but to do a few laps of Deep Temerity. The snow was glorious – soft, dry, fluffy and deep, and the weather was clearing clouds and cold enough to keep it in perfect nick. 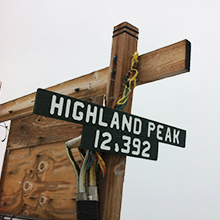 On our third ride up the chair we saw hikers starting to make their way up the ridgeline and decided to go for it. About half-way up we came to a standstill - those ahead were waiting for the majority of the bowl to open. Rather than wait we decided to drop off and were treated to some knee-high powder all the way down. Within 15 minutes we were back at the top of Temerity, hopped on the cat and then started to hike again. This time we made it to the top where a handful of people (who were the more patient ones) had taken all the freshies. The right-hand side of the bowl was still roped off. Again our impatience got the better of us, so we dropped in. It didn’t matter that it was tracked out, the snow was unbelievable. By the time we reached the bottom of Deep Temerity lift we had to make a decision – lunch or another hike to the top, hoping we might hit it just as the remainder opened. It was past 1pm and the energy provided by the muffin had been well and truly depleted. 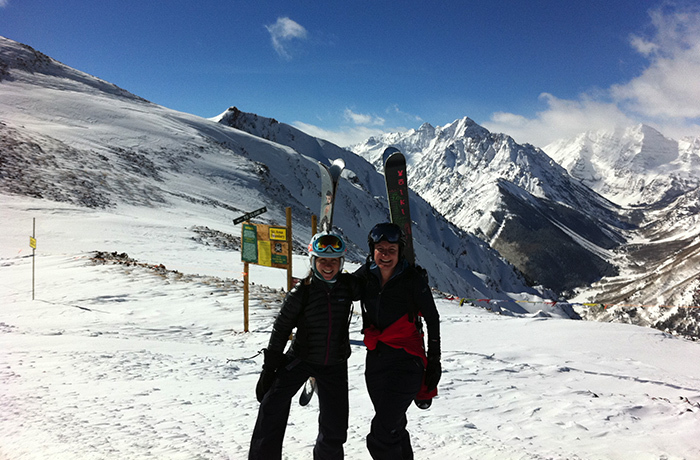 But the snow was too good and we were two fit girls keen for more. It wasn’t a tough decision. This time we waited for the cat to help us up the first part and started chatting to skiers around us. Everyone was pumped by the beautiful day and the powder snow. 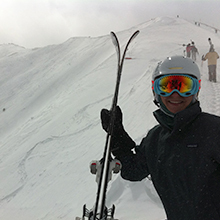 In front of us was Mike, a friendly Aspen local with a blonde bushy moustache all but hiding the biggest smile. As we loaded on to the cat, it turned out we were the last two with only one spot left. Not to worry, Mike jumped in the front allowing us to squeeze on the back. Over the 40-minute hike our low energy levels made the going tough. We pressed on – the right hand side was still closed. This time, once we reached the top, we decided to wait. Mike found us and on seeing our tired faces immediately produced some tasty trail mix and insisted on sharing it. With sugar in our blood we were ready to go again. Being so late in the day we decided they probably weren’t going to open the remainder so started on our way down. Within a few turns we heard someone shouting, “Girls! Girls!”. It was Mike, chasing after us and yelling that they had just opened the last section and to “follow me!”. What ensued was one of the most glorious runs I’ve ever had.Pillows of powder were everywhere as we picked a path through the trees near the top. We came to an opening where the perfect fall line lay ahead and the snow was thigh deep and untouched. We whooped and hollered all the way down and at the bottom I proceeded to give our new friend a huge hug to thank him. I had tears streaming down my face from sheer elation. Mike split and we promised to buy him a beer if we saw him at the end of the day. It was 2.30pm, our legs were spent and it was time for lunch. We thought our day couldn’t get much better but when we called in to Cloud Nine Alpine Bistro it was going crazy – a DJ was playing, people were dancing on the tables in ski boots and, in typical Aspen style, drinking copious amounts of French Champagne. 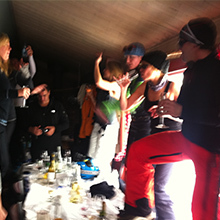 We joined in the party and didn’t leave until ski patrol appeared to kick everyone out. 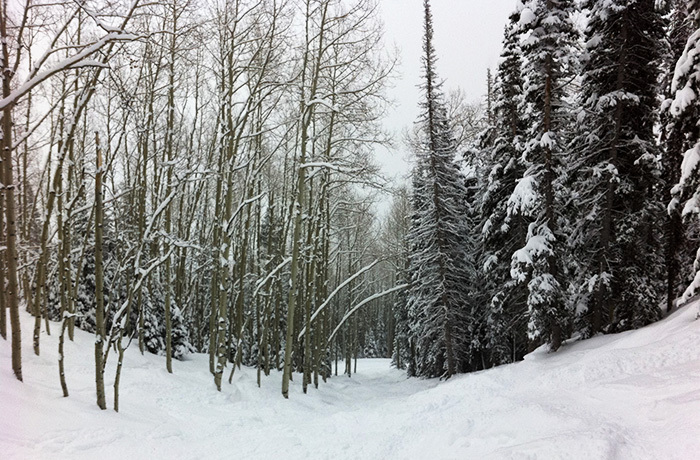 It had been one of life’s dream days and mostly it was thanks to our Aspen Angel, Mike, who led us to the perfect run. It will forever remain etched in my memory as one of the best day’s skiing ever. Sadly we never came across Mike again, but our Aspen Angel is out there and if anyone knows him, tell him to get in touch because we still owe him that beer.